Offering the same aggressiveness and street-focused styling of all their gear, Icon gloves vary from basic protection all the way up to gloves with brawny titanium hard parts. Icon gloves utilize forward-thinking R&D and innovative technologies and the result is products that perform at a high level no matter what the riding style. 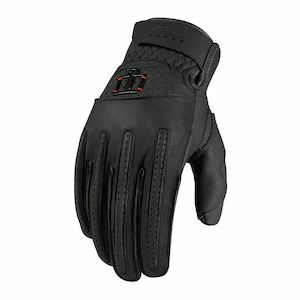 If you're looking for a new pair of gloves, you may want to start your search with Icon motorcycle gloves.